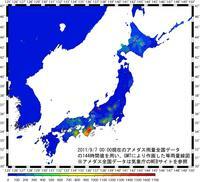 144 hour accumulated rainfall during the passage of Typhoon Talas over Japan, September 7 0:00, 2011. (Source:Ministry of Land, Infrastructure, Transport and Tourism). 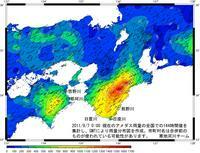 « 平成23年台風12号13号に伴う北海道の降雨分布（9/7　0時現在の6日雨量）/Accumulated rainfall during the passage of Typhoon Talas over Hokkaido in 2011.